Over the past 2 weeks, Biozoom Inc (BIZM) has been one of the best promotions of the summer opening trading for the first time ever at $1.10/share on 5/16/13 and climbing to $3.30 on 6/12/13. Here at Promotion Stock Secrets we have been on top of BIZM since early March way before the ticker even started trading. On March 2, 2013 we did our first research report on the ticker found here while the ticker was still known as Entertainment Art Inc (EERT). We first became aware of EERT when the company filed an 8K for a change of control October of 2012. EERT already had a long history at this point and the filings were littered with suspicious agreements with anonymous foreign entities. On May 19, 2013 when BIZM started traded we did an updated research report found here. We were certain that BIZM was going to become a big name promotion and wanted to have all of our research updated for our members. On May 28, 2013 volume picked up for BIZM and some of members were able to take an early position in BIZM. Late that night after the market closed we were able to find some promotional material for BIZM well ahead of anybody else. See our May 28, 2013 report here (including comments) explaining why we immediately linked the BIZM promoter to Stock Market Authority (SMA) and believe the promotion was being kicked off using boiler room cold calls. In recent days we have decided to take our research into BIZM and the BIZM promotion even further and we think we have found some pretty interesting links that make us believe that Francisco Abellan may be very much behind the BIZM promotion. This report will detail our past findings about BIZM and the BIZM promotion and introduce new information possibly linking BIZM to Francisco Abellan and a past Francisco Abellan pump&dump known as BodyTel Scientific Inc (BDYT). Entertainment Art Inc was set up as a Nevada business entity on June 15, 2007. Gina Sansonia was listed as the incorporator. Joseph Koegel, Ian Beiss, and Robert Lubin were listed as the officers. Attorney, David Lubin of David Lubin & Associates PLLC was listed as the representative for all parties involved. As this page summarizes, Gina Sansonia was working as a paralegal at the David Lubin & Associates PLLC law firm. Robert Lubin is the younger brother of David Lubin. Back in 2004, Robert Lubin was a director and shareholder of Datigen Com Inc [nka Smart Energy Solutions Inc (SMGY)]. Not surprisingly, David Lubin was the attorney for Datigen Com Inc during that time. Joseph Koegel had been the president of Collectible Sales, Inc which is an independent manufacturer’s representative company, serving the major catalogs, syndicators and electronic media with various products including collectibles, health and beauty products, general merchandise and sports memorabilia. Joseph Koegel was also the President of Kingwell Trading, LLC, which specialized in the marketing and sales of solar garden products and houseware items. Ian Beiss had a history with Joseph Koegel as the Vice President of Kingwell Trading, LLC. An S-1 was filed to take Entertainment Art Inc public on July 18, 2008. By this time Robert Lubin was no longer listed as an officer. David Lubin had replaced him as the secretary of the shell. 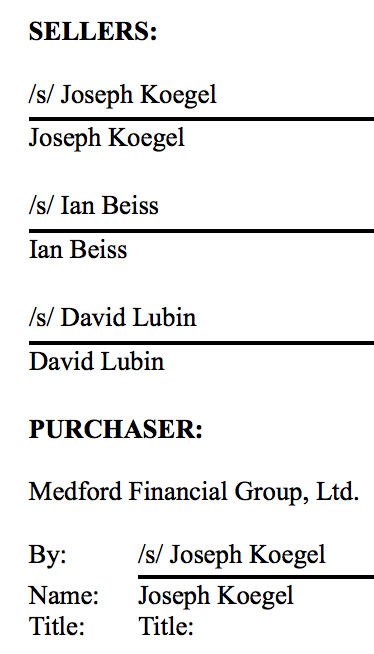 Prior to the S-1 filing, Joseph Koegel, Ian Beiss, and David Lubin each got 400,000 shares at a cost of $1,700 ($.00425/share). 610,000 shares were sold to a group of 34 seed shareholders for cost of $.10/share raising $61,000. Entertainment Art Inc had no revenues when they went public and their only assets were cash received for shares sold prior to filing to go public. Contrary to the name of the company which suggests some kind of business operation involving the entertainment industry, Entertainment Art Inc went public with a forward looking business plan to design, produce and sell a line of fashionable zip bags. Entertainment Art Inc had no website set up, but they told the SEC in the S-1 filing that they planned on registering and building one after going public. The attorney for the S-1 filing was not surprisingly, David Lubin. The S-1 filing was approved on July 29, 2008 on its first attempt. Only 9 months after going public, on May 1, 2009, Joseph Koegel, Ian Beiss, and David Lubin sold their 1,200,000 combined shares to Belize entity called Medford Financial Ltd for $120,000. Ian Beiss would resign from his positions to coincide with the share purchase agreement, but Joseph Koegel and David Lubin would stay on as the sole officers/directors of the Entertainment Art Inc shell. A copy of the share purchase agreement reveals the name of the person signing for the mysterious Belize entity is Joseph Koegel. Why would Joseph Koegel buy shares from himself for more than 23 times the price that he paid for them in the first place? Did he really want to get those shares into an offshore account that badly? Was the $120,000 really actually paid? The subsequent SC13D filing reveals another name linked to the mysterious Belize entity that now had majority control of the Entertainment Art Inc shell as its secretary, Miguel De La Rosa. Miguel De La Rosa aka Miguel Adolpo de La Rosa aka Miguel Adolfo de La Rosa has shown up in some of my past research found here and here. Miguel De La Rosa was a signatory for a Seychelles entity holding debt in Nitro Petroleum Inc (NTRO) in 2008 that later became free trading stock. NTRO was a Shull family linked shell. I believe that Miguel De La Rosa may be working under Andrew Godfrey and Robert Banfield who help set up and sign for many Belize business entities for anonymous insiders of many companies linked to the Shull family and Kenneth Liebscher. A common address for Andrew Godfrey was 35 New Road, Belize which is very similar to the 35 Barack Road, Belize used by Medford Financial Ltd. Miguel De La Rosa can also be linked to GBTO and ROSV. Less than 2 months after passing those 1,200,000 shares into a Belize entity, on June 30, 2009, Joseph Koegel and David Lubin conducted a 33:1 forward split. By the Summer of 2009, despite never spending even enough money on business operations to start a website, EERT was out of cash and had to start borrowing money. Starting in August of 2009, EERT started borrowing money from an anonymous Panamanian business entity called Camal Group S.A. which is also listed in the financial disclosures as a shareholder of the company. Of course Camal Group S.A. found here just used nominee officers so that the real owner of the entity can remain anonymous. By October 10, 2010, EERT still remained a developmental company with no real business operations, not even a website. On October 10, 2010, Joseph Koegel and David Lubin resigned from their officer/director positions. They were replaced by Jeff Lamson of El Dorado Hills, California as CEO, treasurer, and secretary and Tyrone Lamb as secretary. Jeff Lamson lists a bio that goes back to 2005. From 2005 - 2007 he was the CFO of Falcon Technologies, Inc (FLCN). A visit to the old Falcon Technology website gives us more details about Jeff Lamson. 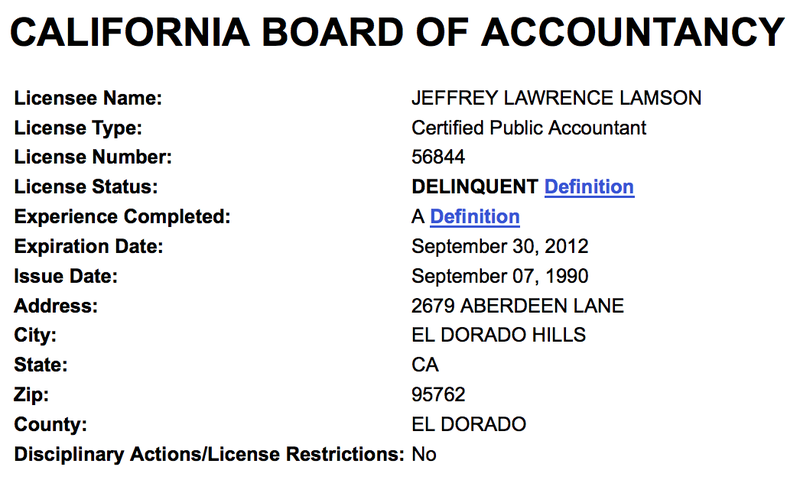 Knowing now that Jeff Lamson is/was a certified public account we are able to find his certification in the California data base. Jeff Lamson's full name is Jeffrey Lawrence Lamson. The age and name match up to that of a person named Jeffrey Lawrence Lamson who in 1999 was found guilty of molesting 2 teenaged girls during his 7 years as a teacher and football coach at Homestead High School in Cupertino, California and sentenced to 3 1/2 years in prison. Read more here and here. A mugshot of Jeffrey Lawrence Lamson can be found here. Recently, this same Jeffrey Lawrence Lamson got his picture taken again by the Medford, Oregon police for a DUI. Jeff Lamson's wife, Lisa Lamson was the original CEO of Red Mountain Resources (RDMP) when it went public as Teaching Time Inc.
After the change in management, new Promissory Notes started to get issued - this time to a Florida business entity called MBN Consulting LLC which is controlled by Steve Sanders and Lorraine Sanders. I am very familiar with the names Steven Sanders and Lorraine Sanders because they showed up often in a recent report that I did about a group of shells linked to Schneider Weinberger LLP. Steven Sanders and Lorraine Sanders were the resident agents for most of the nearly identical shells all taken public by Schneider Weinberger LLP (RDMP, ASPU, BLFL, FPNC, Mobile Vault Inc, and ShopEye Inc). See that report here. Even before I started this report the Belize entity taking control of the officer shares made me think of that Schneider Weinberger LLP report linked in the previous paragraph. I wondered if I would find a Schneider Weinberger LLP link to EERT and sure enough I did. James Schneider of Schneider Weinberger LLP acted as the resident agent for Steve Sanders when he set up MBN Consulting LLC as a Florida business entity in 2003. In a very similar fashion to the Schneider Weinberger LLP shell factory shells, EERT started issuing Promissory Notes to MBN Consulting LLC. As I mapped out in the Schneider Weinberger LLP shell factory research report, Schneider Weinberger LLP often used officers from California in their shells. Jeffrey Lamson fit this pattern perfectly being that he was from California. On April 16, 2012, Jeffrey Lamson replaced the old EERT accountant with a Schneider Weinberger LLP favorite, ZS Consulting Group LLP. On October 19, 2012, an 8k was filed for a change of control. Medford Financial Ltd sold its 39,300,000 shares to Le Mond Capital for $430,000. This time no share exchange agreement is filed with the SEC and no disclosure is given about Le Mond Capital (where it is located or who the signatory is for the entity). Le Mond Capital does have a website. The website discloses that Le Mond Capital is a British Virgin Islands entity. The website was only just created on February 4, 2013, registered using a private proxy. Coinciding with the change of control, Jeff Lamson resigned from all of his officer/director positions and Sarah Deutsch became the new sole officer/director of the EERT shell. In her biography, Sarah Deutsch says has been working as a manager of Magdalena's Party since September of 2011. Internet sources identify Magdalena's Party as a Buenos Aires Restaurant and confirm that Sarah Deutsch works there. Her biography also lists her as working at EliteHealth LLC from December 2008 until September 2011 and at CIBC Wood Gundy from November 2005 until August 2008. On January 21, 2013, Sarah Deutsch added Tefa Dexter to her team as the new secretary of EERT. From 2009 to present Tefa Dexter has been working at The Santa Barbara Group, LLC, a company he co-founded that helps companies with their online sales. Here is their website. Prior to that, Tefa Dexter was involved in the clothing sale industry. The balance sheet that followed the change of control showed that all of the previous debt Notes were taken off the books as part of the undisclosed share purchase agreement. On February 6, 2013, a brand new entity was formed in the state of Delaware as a wholly owned subsidiary called Biozoom Technology Inc.
On March 5, 2013, an 8k was filed for an acquisition agreement between Entertainment Art Inc using its newly created wholly owned subsidiary, Biozoom Technology Inc and a German entity called Opsolution GmbH. Opsolution GmbH was formed as a German business entity on April 25, 2001. As part of the acquisition agreement, Entertainment Art Inc through its wholly owned subsidiary, Biozoom Technology Inc acquired certain, patents, licenses and related assets from each of three separate German companies all controlled by Hardy Hoheisel and Wolfgang Köcher: Opsolution Spectroscopic Systems GmbH, Opsolution NanoPhotonics GmbH and Opsolution GmbH in exchange for $50,000 cash and the issuance of 39,000,000 shares of common stock. As a result of the Acquisition, the shareholders of the Opsolution Sellers became 66% shareholders of Entertainment Art, Inc.
Entertainment Art Inc also entered into a joint venture agreement with Opsolution GmbH, and completed the first round of a preferred stock financing, the proceeds of which are being used for our operations and further research and development. 1,150,000 shares of newly designated 7% Series A Preferred Stock were sold at a purchase price of $1.00 per share, or $1,150,000 total. The Series A Preferred is convertible at a price of $0.133333, or approximately 7.5 shares of common stock for each share of Series A Preferred for 8,625,021 shares. An additional 850,000 preferred shares could still be sold for an additional $850,000 making the total number of preferred shares sold come to 2,000,000 shares convertible into 15,000,000 common shares. As part of the acquisition agreement, Sarah Deutsch cancelled 39,000,000 of her 39,600,000 shares. Sarah Deutsch resigned from all position except her director position. Tefa Dexter remained the secretary. Hardy Hoheisel became the new CEO and a director. Wolfgang Kocher became the new CTO and director. On March 8, 2013, a new Nevada business entity was registered called Biozoom Inc for the mere purpose of merging it into the Entertainment Art Inc shell to effect a name change for the Issuer to BioZoom Inc. 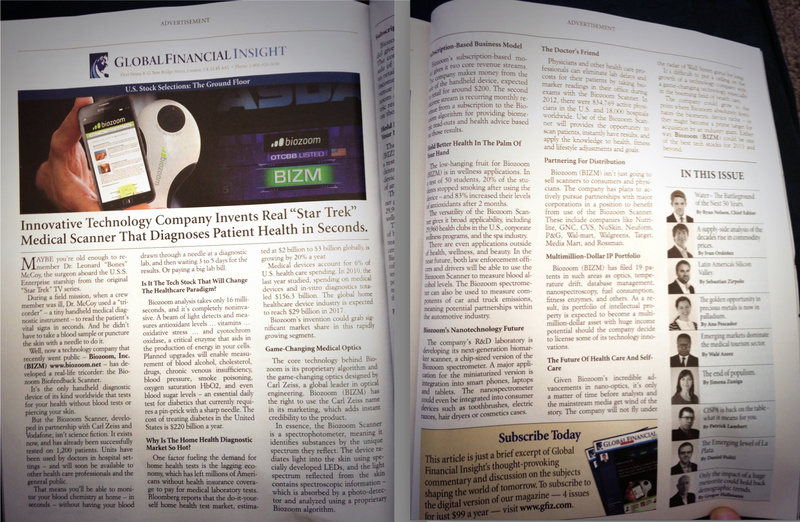 The name and symbol change to Biozoom Inc (BIZM) was officially cleared by FINRA on March 28, 2013. The new Biozoom Inc website can be found here. The website is basically a knock off of the Opsolution German website found here. Biozoom Inc now has control of a long list of patents and pending patents which may or may not all have practical marketing applications. The primary product touted on the website is a hand held non-evasive sensory device that scans blood components. Currently the device is not available for sale, but Biozoom Inc is taking "pre-orders" if you want to leave them your information. 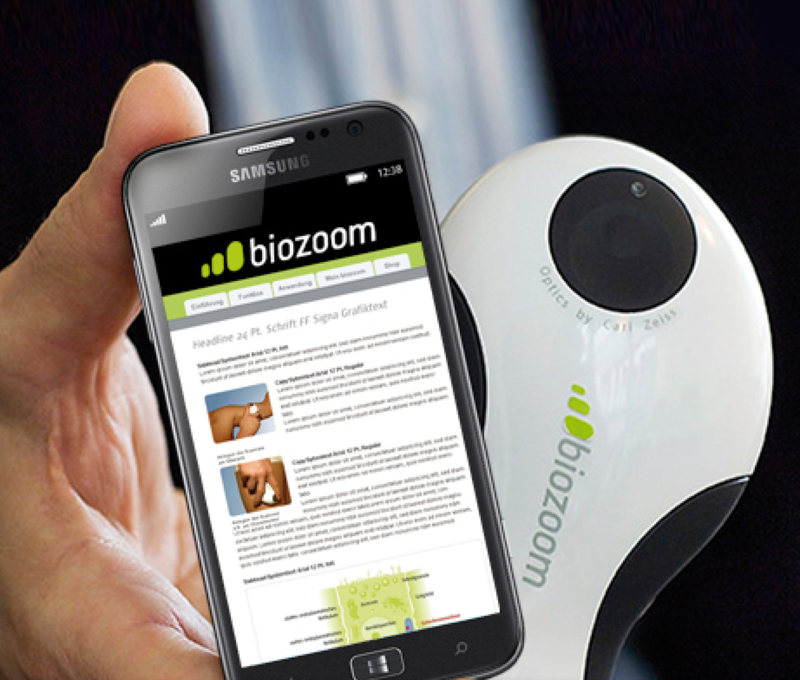 Whether Biozoom Inc will ever actually sell any of their handheld devices or not is still yet to be determined. Future revenues or no future revenues, it doesn't change the fact that in the past, the BIZM shell has been littered with dirty insiders, suspicious debt Notes, suspicious foreign entities, and 20,130,000 free trading seed shareholder shares. Having German entities now involved in the future operations of the company doesn't make BIZM any less suspicious. We considered BIZM to be a good candidate for a future paid promotion back on March 2, 2013, and we still considered BIZM to be a good candidate for a future paid promotion on May 19, 2013. 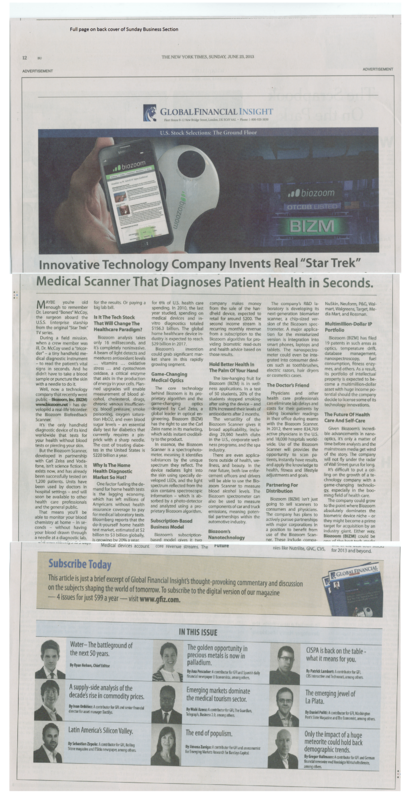 Biozoom Inc (BIZM) started trading for the first time on Thursday, May 16, 2013 with a small 10,000 share block at $1.10. 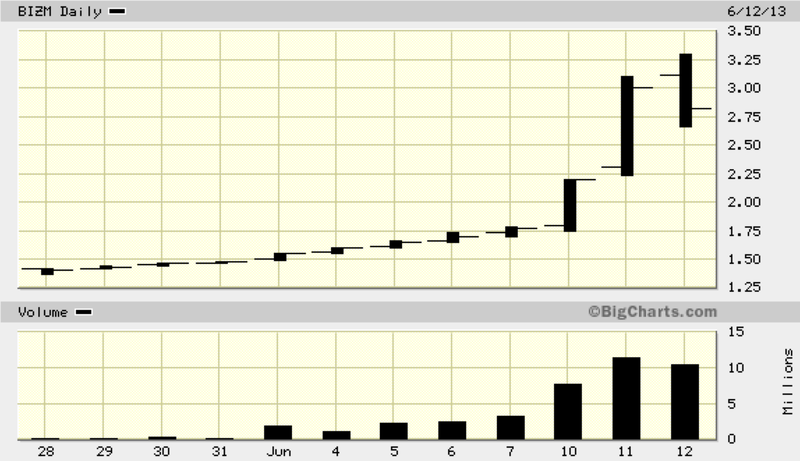 On Friday, May 17, 2013, another 10,000 shares block went off this time at $1.15. Monday May 20th and Tuesday May 21st each saw a single 15,000 share block trade and on Thursday May 23rd 50,000 shares traded. Each day the blocks push the share price up $.05/share and all of the blocks went off with no ask available for the ticker, only a bid. It wasn't until May 28, 2013 that retail investors were allowed to take an early position in the stock at $1.40/share. We already suspected that Stock Market Authority would re-enter the promotional scene with a fresh ticker using some new domains after their ugly list burning efforts with BOPT in April. BIZM was already at the top of our watch list as a possible future Stock Market Authority promotion because of the set up with the German and Panamanian entities. On May 28, 2013 after BIZM finally began to see an increase in volume and retails investors were finally allowed to buy into the stock we went into high gear looking for any clues that the promotion be starting. That is when we came across a 24 page online research report published by a new website called The Stock Report found here. The Stock Report which did the report seems to be suggesting in their disclaimer that they did not receive compensation for the report. Digging through the site some more I noticed that there is a second report for BIZM that is giving BIZM a $10.30 price target and calling it the Stock Report #1 ticker for 2013 ahead of ZNGA and KORS. In the report BIZM got far more attention than the other two tickers. A closer look at the domain thestockreport.com shows that it was first registered in 2005. Using the Wayback Machine website it becomes obvious very quickly that the site changed ownership sometime after June of 2012 and in March of 2013 it became the website that you see today. According to the Disclaimer, The Stock Report is owned by Global Investor Research LLP which has two websites of their own found here and here. The gfiz.com was registered back in 2006, but was recently just updated on March 13, 2013 (same day as The Stock Report website). 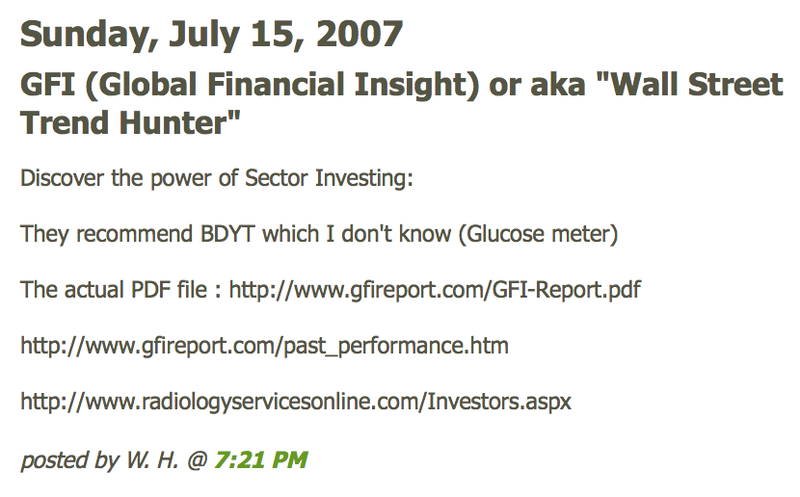 GFI is short for Global Financial Insight (more on this later in the report). The second links isn't working but the host site used reminds me of the early SMA websites because they used the same host site (Parallel Planels of Parallel Holdings IP GmbH - a German hosting site). The Stock Report / Global Investor Research is based out of the UK according to their websites. Fleet House 8-12 New Bridge Street, London, UK, EC4V 6AL. The UK is the same place as Elliott Dobbs claims to be from. Even though we have been expecting SMA to reemerge with new websites, at this point I am far from sure that this could be SMA reinventing themselves. When a brand new site like this suddenly pops up I naturally wonder with whom they might be associated. Could Ryan Nelson be the new Elliott Dobbs? Also interesting is that only one domain can be linked to these Stock Report domains - callgen.net. Callgen.net is not a published website yet, but there are several similar sites like callnet.com, callnet.co.uk, and call-net.com all of which offer some kind of call center service. Makes you wonder if there is a legitimate link here possibly having to do with boiler room type phone calls. Over the next 3 days, the bump up in BIZM volume continued some of which was from members of Promotion Stock Secrets buying in early based on our early findings of the BIZM promotional material. It was during this 3 day stretch that some more promotional links were found. The gifz.com domain published two reports found here and here. One more domain also was found touting a BIZM research report - emergingpennystocks.com - see their report here. 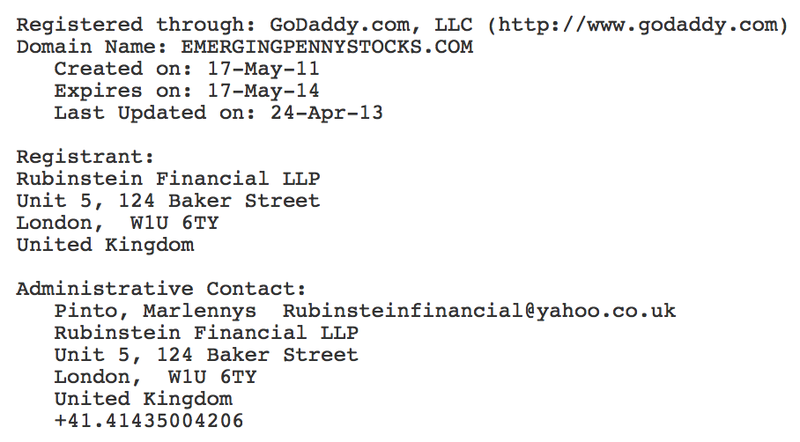 emergingpennystocks.com lists UK resident, Marlennys Pinto of Rubinstein Financial LLP, as the domain registrant. Rubinstein Financial LLP is a UK business entity formed on January 28, 2013 using two Panamanian nominee officers - Eyda de Freitas Garcia and Marlennys Pinto. 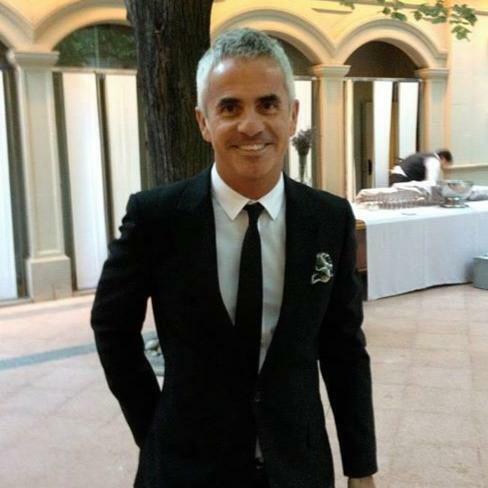 Could it really be Francisco Abellan that is behind setting up these foreign entities and the promotional material? On June 3, 2013, the same day that BIZM promotion went mainstream and volume really picked up, The Stock Report published a 29 minute promotional video for BIZM. Notice the similarities between that video and past SMA videos? On June 7, 2013, like many of the other big name penny stocks promotions of 2013 including ECAU, GNIN, OCTX, LOTE, TALK, NORX, and NHUR, BIZM was added to the Borse Berlin stock exchange. See another link here. After a few days of steady volume and slow controlled climbing action, on June 10, 2013, BIZM finally broke out becoming a much more prolific promotion in the process. Over one year ago we published information about Stock Market Authority and its possible links to Francisco Abellan found in our report titled "A Peak Behind Stock Market Authority" found here. What I didn't realize when I wrote that report is that before there was Stock Market Authority there was Global Financial Insight and that it was Global Financial Insight that morphed into Stock Market Authority. Now Global Financial Insight is back touting BIZM. Back in 2007 Global Financial Insight promoted China VoIP & Digital Telecom Inc (CVDT) using online research reports and a hard copy mailer. CVDT was mentioned in the ongoing DOJ/FBI investigation of Francisco Abellan. After China VoIP & Digital Telecom Inc went public in 2006 as Crawford Lake Mining Inc, a Panamanian company called Apollo Corporation took control of the shell as disclosed in this 8k filing. According to litigation filed by the SEC against Francisco Abellan on August 13, 2008 for Abellan's role in running an illegal pump&dump promotion on GHL Technologies Inc (GHLT) in 2005, Apollo Corporation is secretly controlled by Francisco Abellan. Here is a great article about the GHLT pump&dump and subsequent litigation. The whole set up and execution of that promotional scam sounds very very familiar. It basically became the playbook for many subsequent promotions. CVDT was not the only Francisco Abellan linked ticker promoted by Global Financial Insight. In 2007, GFI also promoted BodyTel Inc (BDYT). See this link for more details. BDYT had Francisco Abellan's name all over it. BDYT had basically the entire Raystream Inc (RAYS) crew involved. RAYS would become an SMA promotion on October 10, 2011. Michael Kang and Francisco Abellan (aka Francis Villena aka Frank Abel) who together organized fellow SMA promoted ticker, Lithium Exploration Group Inc (LEXG), were very large beneficial shareholders in BodyTel Scientific Inc (BDYT) [now revoked] through their joint entity, Bridge Capital LLC. BDYT went public in 2005 as safenet.com. One short year later in December of 2006, BDYT signed a joint venture agreement with a German company called Safe-com GMBH & Co. and another company called Glucotel Scientific Inc which was controlled by another German named Stefan Schraps. Stefan Schraps would become the new CEO of the BDYT shell. Some how Vega Star Capital would also gain control of 1,500,000 shares around this same time. On February 27, 2007, Vega Star Capital and Galaxy Equity Holdings Inc held a combined 2,125,000 of the 3,975,000 outstanding shares. The individual signing the joint venture agreement for Safe-com GMBH & Co. was Tan Siekmann. of RAYS as pointed out by Janice Shell in her streetsweeper article. Rumpf's name still shows up on the domain registration for safe-com.com. Roman Rumpf's partner with Raystream GmbH is Thomas Friedli. Tan Siekmann uses Friedli as a partner with another German entity known as eLogic GmbH. One of the officers listed for North American FX Inc is Michael Kang (president). RAYS and BDYT insider, Tan Siekmann, is located right in the same neighborhood area as BIZM in Kassel, Germany. I wonder if Tan Siekmann and the new CEO of BIZM, Hardy Hoheisel, can be tied together through any business entities or past business relationships. 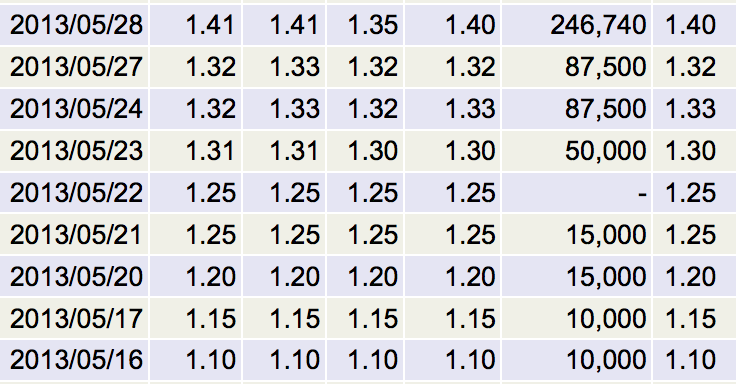 So we have BDYT strongly linked to SMA tickers RAYS, LEXG, and now BIZM. Besides the same Promotional Company, the German connection, the shady foreign entities, and most likely Francisco Abellan in common between the two tickers, BDYT and BIZM also shared a very common business plan. Bodytel Inc (BDYT) through its German entity, GlocoTel, claimed to be developing a Blood Glucose monitor that would be small enough to carry on your key chain. The monitor would also have the capability of sending results wirelessly through the patient's cell phone so that data can be managed and tracked through the GlucoTel data base. 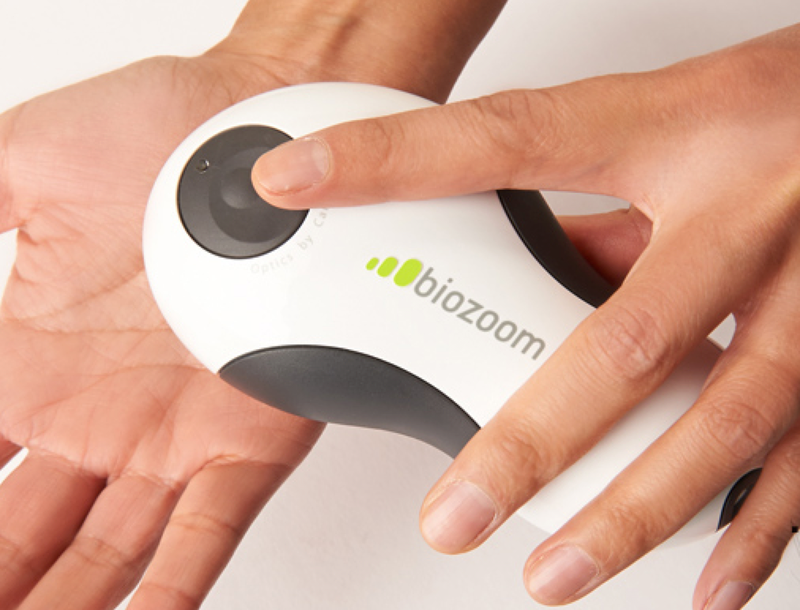 Biozoom Inc (BIZM) through its German entity, Opsolution, claims to be developing a hand held non-evasive sensory device that scans blood components then allows you to upload the results through your cell phone into the Biozoom data base to be tracked. BDYT never made a penny in revenues and to date neither has BIZM. BIZM appears to be nothing but a rinse repeat of the BDYT pump&dump masterminded by Francisco Abellan. Once BDYT reached its peak, the pump-and-dump ticker fell from $3 to $0.02 in just three months. Referring back to the SEC litigation against Abellan found here, we notice that when Abellan was promoting his company GHL Technologies Inc (GHLT) [now known as Green Bridge Industries Inc (GRBG)] he used an online newsletter and nice glossy mailers from a stock promotion company called "The Street Stock Report" which is very similar to "The Street Report" used by BIZM. The GHLT share price jumped from $1.83 in early May of 2006 to a high of $8.80 in June of 2006 allegedly reaping in $13.5 million in ill gotten gains for Abellan. By August of 2006 the stock was trading at less than $.01/share. Read more here and here. The SEC/FBI conducted an asset freeze against some (not all) of Abellan's accounts. The SEC entered a judgement against Abellan for Civil penalties and disgorgement, but so far those penalties have not been paid. Documents filed with the Seychelles government related to Red Sea Management, Sentry Global Securities, and Jonathan Curshen suggest that Abellan is a wanted man by the FBI. The use of foreign accounts to hold debt and shares remains a common theme in all recent stock promotions alleged to be linked to Francisco Abellan. We highly doubt that BIZM will ever end up reporting a single penny in revenues. We cannot be sure how long the BIZM promotion will last or how high the price will ultimately go, but we are sure that eventually the BIZM share price will crash just like all the previous promotions linked to this group did. Thanks a bunch for this highly informative article!!!!!!!!!! A client of mine brought your article to my attention, and admittedly I found it quite iinformative and detailed. Although I am not aware of either the business or the shareholders of the company for the last several years, I did want to point out that the 13D filed in May 2009 with the SEC which included the purchase agreement as an exhibit thereto was signed by Medford and could not have been signed by Joe Koegel. Mr. Koegel owned no equity in the company when our shares were sold in May 2009 to Medford, as we disclosed to the SEC. Moreover, as your article correctly indicates, the company was dormant while I was an affiliate. If you have any further questions, please do not hesitate to ask. this really is one amazing report. Jeffrey Lamson arrested for $400k embezzlement.